The Barnett Vengeance represents a quantum leap in crossbow evolution. 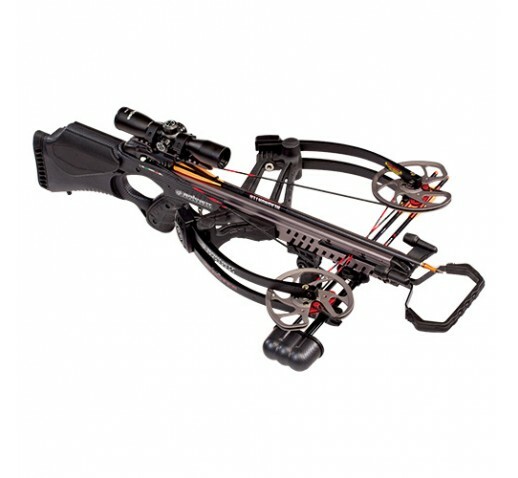 It is the first crossbow to combine a lightweight CarbonLite Riser with reverse draw technology. In this radical new reverse draw configuration, the limb pockets are moved closer to the trigger assembly and the limbs face forward on the bow, thus shifting the center of gravity closer to the shooters body. This drastically reduces the weight at the front of the crossbow, which is essential for a well-balanced shot. The most technically advanced riser ever created for a crossbow, the CarbonLite Riser removes approximately 43% of weight from the riser, which dramatically shifts the balance point to the shoulder. The combination of the reverse draw design with the CarbonLite Riser allows the Vengeance to provide the steadiest and most accurate shot possible. Decorated in a carbon fiber finish or in a high-definition camouflage, the Vengeance is available through retailers as a complete package with crossbow, quick detach quiver, three 22 arrows and an illuminated 3x32 Multi Reticle Scope.